Stunningly beautiful property. 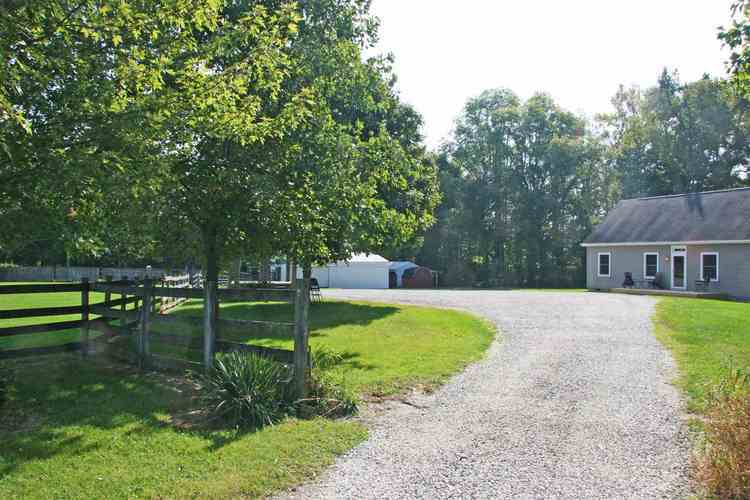 Rolling and lush, the acreage is all located in front of this home. This provides seclusion and complete privacy. This used to be the location of a few rodeo so the ring and lighting still remain as well as a nicely maintained 30X40 3-4 horse barn (has an additional 12X40 lean-to attached), free standing lean-to and a small shed. There's is a gazebo next to the ring that is perfect for picnics and just enjoying a breeze while sipping tea. The home has an amazing great room with vaulted ceilings. Two rooms above are connected by a railed catwalk over the great room. One is finished and could be used as a bedroom. The other is perfect for storage or could also be easily turned into a bedroom, office, craft or playroom. ALL bedrooms are split--not just the main from the others. Lower level includes the master and 2nd bedroom while the third is upstairs. Large main level laundry room has an outside entry and shower so no dirt has to be tracked through the house if someone has been out enjoying the property. The horse barn has room to park a couple of cars, but there is ample room beside the house to add on an attached garage. Brand new deck on the front of the home, but also a deck off the back. This property is naturally enclosed by a thick line of trees, but could be cleared in places to enjoy views of the pond on the property south of the home. Easy access off of US 30. A beautiful part of Northern Indiana to call home. Directions:US 30 W. to 900 E. between Larwill and Pierceton, turn left. 900E. becomes 950 W., turn right on 250. Home is first drive on the left.